Technology that has helped Israel’s military drive tanks, guide and intercept missiles, and keep its computer systems secure is being redeployed in the development of driverless cars. “A lot of the entrepreneurs are coming out of the Israel Defense Forces and they tend to be older than the traditional Silicon Valley (entrepreneurs),” Ford Executive Chairman Bill Ford Jr. told Reuters. The words in the article, “They have a lot of judgment and wisdom,” are a striking statement for a country only 70 years of age and continuously threatened by its neighbors with total destruction. That, however, seems to be the key to wisdom and judgment, meaning that Israel is being forced to be a step ahead of the rest of the world. Thus, the curse of the enemies returns to Israel in the form of blessings. Solomon, the son of David, had this to say: “To know wisdom and instruction; to perceive the words of understanding; To receive the instruction of wisdom, justice, and judgment, and equity; To give subtilty to the simple, to the young man knowledge and discretion. A wise man will hear, and will increase learning; and a man of understanding shall attain unto wise counsels: To understand a proverb, and the interpretation; the words of the wise, and their dark sayings. “The fear of the Lord is the beginning of knowledge: but fools despise wisdom and instruction” (Proverbs 1:7). 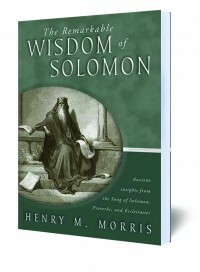 #2223 Ancient insights from the Song of Solomon, Proverbs, and Ecclesiastes.